Played a couple of games this morning and, it's Madden alright. Probably could have played one from 10 years ago instead and not noticed much of a difference. But it's still fun! I'll have to decide if I want to go through and make some roster changes and get those reasonably up to date or not. Probably just big names like Anquan Boldin, Reggie Bush, etc. I was able to beat the computer on Pro and All-Pro pretty easily, so I'll see how I do with All-Madden next time. 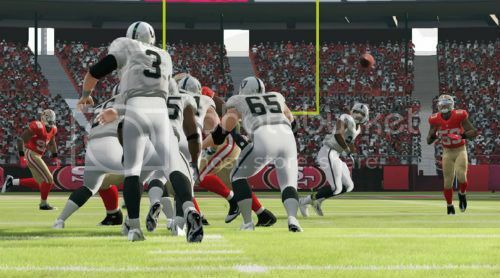 I remember the last time I really played Madden, maybe 2005 or so, I found All-Madden much more challenging than usual, but maybe they've made it easier again. I should pick this up at some point. Haven't played Madden in years, but I always enjoy it when I get the hankerin'. Wow, 12 bucks? Can't really beat that. I'm still playing mine. Lost a league game 49-7 today, woo!.. Been loving this lately. Watching NFL on the big screen and playing a game on the Gamepad works so great. Hopefully EA doesn't keep screwing us over for long. But one complaint: Is there really no way to do a fantasy draft? How can something that was in N64 Maddens not be in this one? It is definitely there. I'm in a league where my team was 100% handpicked by me. I didn't set it up, however, so I don't know exactly what to do with it. You might have to start an Online "Connected Careers" and just do it alone. Offline shouldn't be different though. There is an option, I believe, which is a Yes/No toggle for "Fantasy Draft?" Something like that. EDIT- And YES, Nintendo got it right; game on the big screen, Madden on the small screen. XBOX gives you the exact opposite, and at a much larger differential in size. I don't know how the thumbnail in the corner at the top of the TV is even watchable.